Sitting in Ross Perot's favorite booth at a fancy Dallas restaurant, Leigh Valentine eats half of her low-fat redfish and then explains her husband's "disguise kit." The kit contained several fake moustaches and a $1,200 custom-made wig. Robert Tilton, the Texas televangelist, carried it everywhere, and during their first year of marriage he wore disguises "50 percent of the time," Valentine says. It's a tale she's told before, under oath in divorce court--the disguise kit, and the nights aboard a yacht in Fort Lauderdale or in various mansions where Tilton would throw her down stairs, slam her against walls, or hurl cordless telephones at her head; how Tilton would drink himself into blind rages and declare he was the Pope, or wake up in the night screaming that "rats were eating his brain." Valentine, a former Miss Tallahassee, Florida, further explains why Tilton felt compelled to use disguises in 1995 but probably doesn't anymore, and why, despite having spent $6,000 on private detectives in Texas and Florida, she has no idea where her husband is right now. "We would go to restaurants here in Dallas, and people would give us the finger," she says. "People would scream at us on the street. It was incredible. Bob hated Dallas, and the more he hated Dallas, the more he loved Florida. He said Fort Lauderdale was like his cloak of invisibility. Nobody would ever find him there. No one recognized him. He could wear shorts and Hawaiian shirts all day and do whatever he wanted." Apropos of nothing, Valentine announces she's "doing a book and movie deal" (working title: The Dark Side of the Cross). Later, over coffee, she says she hopes any story resulting from tonight's interview will ignore her drunk-driving arrest last month, which occurred after she broadsided another motorist at a Dallas intersection. It would be nice if she were described as 39 years of age instead of 41, she notes. "And call me Leigh Valentine, not Leigh Valentine Tilton," she says. "I don't know how I got myself into this mess. I mean, I'm the daughter of a surgeon. I wish I'd never heard the name Tilton." Parting words: "Find Bob. I want photos of him. Him and whatever girlfriend he's with. He keeps telling the judge he's broke. He keeps pretending he's changed. Bob Tilton will never change, and he'll definitely never be broke." 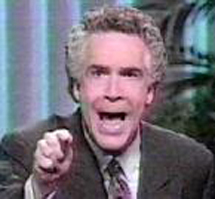 If you want to find Robert Tilton these days, a good place to start looking is at a South Florida television studio. While members of Tilton's Dallas church may believe that Tilton has vanished from the face of the Earth or is busy doing God's work in some Third World backwater, he's in fact alive and well and living in South Florida, busily preparing his own resurrection. At his peak he purchased 5,000 hours of air time per month and appeared in all 235 U.S. television markets. His daily Success-N-Life show reached nearly every television set in North America. Tilton's mass-market ministry pulled in an estimated $80 million per year, and his church drew as many as 5,000 worshippers to Sunday service. Tilton gleaned the donations by pitching a narrow, well-oiled version of the Pentecostal "prosperity gospel." In exchange for $1,000 "vows" from followers, Tilton promised to lobby God for miraculous improvements in their health and finances. According to one survey, he spent 68 percent of his air time asking for money. "If Jesus Christ were alive today and walking around, he wouldn't want his people driving Volkswagens and living in apartments," explained Tilton, who favored a Jaguar or Mercedes-Benz and lived a lavish private life in mansions in San Diego and Dallas. Then came November 21, 1991. On that evening, ABC's PrimeTime Live aired the findings of a six-month investigation into the ministries of Tilton and two other local TV preachers, W.V. Grant and Larry Lea. The segment on Tilton was by far the most damning. At its heart was the accusation that Tilton never saw the vast majority of prayer requests and personal correspondence sent to him by faithful viewers. On the air, Tilton promised to pray over each miracle-request. But on the ground, ABC said it found thousands of those requests and viewers' letters dumped in garbage bins in Tulsa, Oklahoma. Checks, money orders, and in some cases cash, food stamps, and even wedding rings sent by followers had been removed for deposit at a nearby bank. Eighteen months later, the screen went dark. By the time Tilton announced the cancellation of Success-N-Life, the show had lost as much as 85 percent of its audience. Contributions to the ministry had dropped from $7 million per month to $2 million, according to Tilton's attorney J.C. Joyce. "It is a matter of the media," Joyce said, addressing reporters. "You are responsible for what has happened to this church." Tilton himself referred to reporters as "devils." These days the trip to Tilton's Word of Faith Family Church in Farmers Branch is an unsettling one. High up on the facade, the wind whistles through a broken pane of stained glass. Bob Wright, a caretaker pastor put in place by Tilton last spring, parks his white Jaguar a few yards from a disused satellite dish. Inside this high-tech tabernacle, thick curtains seal off empty balconies that once held thousands. Tilton's appointee preaches to a combination of poor blacks and elderly whites that numbers about 130. The service is a desolate mix of hymns followed by Wright's wandering exhortations and, finally, a tepid dose of faith healing during which parishioners move to the front, receive the laying-on of hands, and slump to the carpet for a few moments. There's a money-plea to wind things up, but no mention of the absentee landlord. A few months ago, according to one attendee, the congregation took up a collection for Tilton's lost scuba gear. Lost in the chronicle of Tilton's battles with the media, the Texas state attorney general, and various civil plaintiffs is the fact that Tilton has all but won his holy war. Last summer a $900,000 jury award against him was overturned on appeal. Eleven other lawsuits have been dismissed, dropped, or settled out of court. Fraud investigations of Tilton's ministry by state and federal authorities ultimately failed to produce any conviction. And Tilton is close to ridding himself of the second of two wives whose allegations of physical abuse and drunken debauchery made for colorful headlines but were never proven in court. "After all the headlines and all the investigations and all the audits, they couldn't find one damn thing that this man or this ministry had done wrong," says attorney J.C. Joyce. "There never was any dirt on Robert Tilton. In the end it was all a pack of damn lies. But there hasn't been any story about that, has there?" To judge the health of his mass-market ministry on the basis of church attendance in Dallas betrays a fundamental misapprehension of how his operation works. As recently as last summer, Tilton stated that church revenues totaled an astonishing $750,000 to $800,000 per month, court transcripts show--this at a time when Tilton had been off the air for nearly two years. Only a small portion of church revenues ($20,000 per month) come from leases on church-owned property, Tilton said. Ole Anthony, the Trinity Foundation leader who assisted ABC in its investigation, claims the church in Farmers Branch is little more than a money-losing prop designed to repel IRS scrutiny of Tilton's tax-exempt status, a charge Tilton's lawyer denies. At any rate, 130 hardscrabble parishioners don't generate $750,000 to $850,000 per month. So where does the money come from? The answer is Tilton's mailing list, which once contained 880,000 names and addresses. Just as national political campaigns depend on mailing lists of potential contributors, they are the crucial, invisible keys to American televangelism. According to former Word of Faith church members, Tilton employed hundreds of minimum-wage "prayer warriors" to answer his toll-free hotline. When viewers called in, their names and addresses were entered in computer banks. The master list was then used to generate mailings to the faithful--and more pleas for money--over and over again. "Do you need more money?" reads the question on an envelope received by a California resident a few months ago. A pair of pennies is visible through a cellophane window in the envelope. Inside the envelope is a message from Tilton: "Take the miracle request prayer sheet that I have enclosed with the coins and carefully write down the areas of your life (especially financial) where you want me to release my anointing on your behalf... and then WRITE A CHECK FOR THE BEST POSSIBLE GIFT THAT YOU CAN GIVE!! Make it a widow's step-of-faith and give the devil a black eye by placing the biggest, largest, most generous gift (that would defy natural reason) into God's work." Tilton includes instructions to pray over the coins and send them back with a check. "Your two token coins will be placed in my New Testament Treasury Chest for me to bless every day," he writes. "I will then send you an anointed miracle coin to use as your miracle reminder and as a point of contact to carry with you wherever you go." "Everything was crumbling around me," Robert explains. "My two best friends had just sued me. My landlord had served me with an eviction notice. I was jobless and flat broke. I wouldn't answer the telephone because I knew it would be a bill collector. "I was cowering in a chair with all my curtains closed. Heartbreaking love songs gushed from the stereo...I lit a joint. "Robert Tilton was praying [on TV]. I can't explain it, but I heard him say, 'You. Right there. You're smoking a joint.' I dropped the joint and he said, 'You just dropped it.' I started crying. I KNEW IT WAS GOD TALKING TO ME." The mailings invariably come with trinkets such as seeds or salt packets. A Dallas woman received a small strip of red polyester. "Right now this cloth is plain fabric," Tilton wrote, "but after I send it back to you it will be a Miracle Cloth saturated with the presence of God." As Jim Moore, owner of an Oklahoma printing company that handles Tilton's outgoing mail, explained to a hidden news camera in 1991: "It's all about names and addresses." The problem is that mailing lists grow stale when the TV screen stays dark too long. Now, though, it's bright once more. Tilton's toll-free prayer line is up and running, and his Tulsa, Oklahoma, post office box awaits a hoped-for onslaught from the faithful. Every weekday between 11 a.m. and noon Eastern Standard Time, a fiberoptic telephone line carries the voice and image of Robert Tilton out of a small TV studio in Miami Beach. The signal runs under city streets and across Biscayne Bay until it reaches WPBT-Channel 2, a public television station in North Miami. A for-profit affiliate of the station called Comtel beams Tilton's brand-new Success-N-Life show up through the heavens to a satellite transponder. Unless you own a satellite dish, you can't see Tilton's show in South Florida. Instead, you must move to Los Angeles, Nashville, Detroit, or Atlanta, where Success-N-Life began airing on various cable channels in April. Two months ago, Tilton moved into the New York market and now appears there twice daily. The new Tilton seems a bit less frisky. Gone are the tirades against Satan and his minions. His hair is less flamboyant. The old studios in Dallas and San Diego were lugubrious dens lined with leather-bound books. The new set looks like a Sunday-school vision of ancient Palestine, complete with Styrofoam "stone" walls and a burbling fountain. Tilton sits beside the fountain to read samples of viewer prayer requests. Beyond the sound stage walls lie a towing company and a construction site. But inside, all is peace and tranquility. "When it first came out in April, it was pretty much like a normal religious show," says a source involved in its production. "Then after five or 10 shows it started to change. [Tilton] pretty much stopped talking about Scriptures. It was just a sales pitch. As a Christian, I find it a little disturbing." Intercut with Tilton's sermonizing are "testimonials" in the form of news reports about people who have received miracles after giving money to Tilton. One recent testimonial featured "Rex and Kay," a Dallas couple who lost everything when a Sunbelt construction boom went bust. Within days after sending their last $1,000 to Tilton, Rex got a new job, and the pair made plans to build a new suburban home. The testimonial, according to its own tagline, was produced by Paul Pettite. Pettite was laid off by Tilton in the early '90s. Ronald Wishna, who is listed on corporate records as the owner of the Miami Beach studio, declined to discuss Tilton. But another local entertainment industry source said Tilton and his associates paid cash up front for a two-year lease on the 50-by-50-foot soundstage. They invested another $30,000 to transform the building's interior. "These guys are geared up for real, and they're here to stay," the source says. "They're a real piss to hang out with. They're just good ol' Texas boys. They like to smoke cigars and drink brandy and have a good time on South Beach. But they like to keep a real low profile. Tilton told me once, 'I just want to come here and be left alone.'" If Tilton is ready for some R&R in the subtropics, it's understandable. Though he dropped off the national radar screen in 1993, the meltdown of his ministry continued. * In late 1993, Tilton fired, then divorced, his co-pastor and wife of 25 years, Marte Phillips Tilton. For a time the split seemed amicable. Now Marte Tilton is suing her ex-husband and attorney Joyce for fraud, breach of contract, and negligent misrepresentation. * In March 1994, according to news accounts, police responded to Word of Faith World Outreach Center to quell a disturbance caused by a walkout of congregation members. At issue was Tilton's relationship with leaders of a North Carolina charismatic sect that practices a form of shouted prayer known as "demon blasting." (Demon blasting involves sect members forming "prayer circles" around a child believed to be possessed by demons and shouting at the subject for hours at the top of their lungs.) In sermons, Tilton has credited sect leaders Sam and Jane Whaley with saving his life in 1993 by casting out his own demon. Tilton was introduced to the Whaleys by his second wife, Leigh Valentine, whom he secretly married in the Dominican Republic February 10, 1994. * In September 1995, Tilton and Leigh Valentine moved into a new $1.6 million home in Addison. Two months later Tilton filed for divorce from Valentine, only to cancel the action. On March 11, 1996, he sued for divorce again. * On March 16, 1996, after announcing his call to evangelical work in Cuba and the Philippines, Tilton named Chattanooga, Tennessee, preacher Bob Wright as senior associate pastor of the Dallas church. Then he vanished. When Tilton finally decided to duck and run from Dallas, he did it right. Picking up his trail in South Florida is no small task. There is no telephone listing in his name, either published or unpublished; no property records in Dade, Broward, or Monroe counties; no car registration with the state Department of Motor Vehicles. Corporate records show that Tilton registered his nonprofit Word of Faith World Outreach Center Church Inc. in Florida more than a decade ago, but the registration is inactive. There are a few titillating hints in the Broward County court files: a trio of traffic tickets handed out over the years (one for doing 93 in a 55 m.p.h. zone on Christmas Eve, another for "failure to use due care," and a third this April for driving without registration documents.) Computer research reveals 12 addresses used by Tilton in the last decade, three of them in Fort Lauderdale. But two of those are commercial mail drops, and the last, a $500,000 waterfront vacation home in the Rio Vista, Florida, neighborhood, was sold last year as part of Tilton's divorce settlement with his first wife; ditto for his 38-foot fishing boat. "Not here," says a bartender at a fashionable Fort Lauderdale bistro. "He used to sit outside and drink single-malt Scotch, but we haven't seen him in a few months." Federal records show that Tilton bought a 50-foot Carver motor yacht last year in Fort Lauderdale for $500,000. In July 1996, he told a judge in Dallas that he was living aboard and making $4,000 monthly payments on the boat, which he named the Liberty Leigh. "I haven't seen him or the boat in over a year," says a resident of Bahia Mar Marina in Fort Lauderdale, where the yacht berthed for several months. "Robert Tilton is an individual who resides in Broward County, Florida," says the preamble to Marte Tilton's current lawsuit against her ex-husband. The lawyer who wrote the preamble, James Clutts, says he doesn't know where in Broward County. Tilton's trail warms up a few miles south. The directory in the lobby of an office tower on Michigan Avenue in Miami Beach lists "WOF, Int'l" -- shorthand for Tilton's Word of Faith ministry. But Tilton doesn't enter or exit the building. Although there are plenty of Texas license plates outside the Miami Beach studio, Tilton's blue Chevy Tahoe Tilton is not attached to any of them. "Bob's mail ministry is a lie and a total deception. He does not write those letters. He did not even proofread them during our marriage. He makes it sound like [he's] writing to you right now, this is what God spoke to me for your life, Jesus will appear to you tonight; if you sleep with this little red cord under your pillow, you will prosper. He doesn't even know what's going out to those people, and he doesn't care, as long as they send their money in. That is stealing from people. Most of those people are on welfare. They're little Hispanics and blacks. And he even said, what I do is I look at a map and we go after the ghettoes, we go after those on welfare, we go after those that don't read, those that are lower socioeconomic backgrounds. That's who we send our letters to..."
Q. Have you now given me your full list? A. No. That's a lot right there. Do you want more? Q. Well, I wanted the lies that you were referring to in your prior testimony. A. Just the lies about the trips, that they're ministry church trips, when they have nothing to do with God and ministry. When we went to Israel, he said it was going to be a holy time, we'd get away with God, and all he did was drink the whole time I was with him and lay in bed. And one time he got so sick from the drinking, he was just in bed, we didn't get to see any of the sights. We never went to Jordan. We never went--you know, when we did go to Caesarea, he drank most of the time, and wanted to go to a fashion show, and so that's what we did on the church's money. On Friday, October 10, Robert Tilton checked out of the Hyatt in Jerusalem. Ten days later (and 18 hours after Leigh Valentine described his disguise kit in Dallas), Tilton arrived from Europe at Miami International Airport looking tanned and fit, rather younger than his 51 years. The next day at noon, Tilton sat down to lunch with eight friends and associates a few blocks from the studio. Topics of conversation: the weather, the new show, and Leigh Valentine's recent DWI arrest. Tilton wore a pair of late-era-Elvis sunglasses, expensive gray slacks, and a white linen shirt with French cuffs. Another lesser-known client of Joyce's is the Rev. James Eugene Ewing. For years, from a stucco mansion in Bel Air, California, he has supplied Tilton and other big-name evangelists with computer-driven mass-mail campaigns filled with fractured grammar, homespun homilies, and twisted scriptural interpretations. One of Ewing's letters, written for evangelist Rex Humbard, reportedly brought in as much as $64 per mailing. In 1968, Ewing, an eighth-grade dropout, doubled Oral Roberts' cash flow almost overnight with another mail campaign, sources say. Roberts rewarded him with an airplane, according to former Roberts aide Wayne Robinson. Robinson says Ewing travels in a fleet of black Lincolns and Cadillacs with a crew of bodyguards dressed like Secret Service agents. Leigh Valentine claims she and Tilton visited Ewing on five occasions during their marriage and described Ewing's high-security mansion as "dark and spooky." According to an October 1993 memorandum to Tilton's lawyer, Ewing's latest coup is a computer demographics program that identifies and isolates some of America's poorest sub-ZIP codes and then targets them for Ewing's garish, trinket-driven mailings. "The size of each special area is about two to four city blocks," the memo notes. "And thank God there are tens of thousands of them across the nation." Joyce says Tilton stopped using Ewing's mailings when he went back on the air in April. "They filled the bill until Bob could get back up and started doing television. Their ministries are not a lot alike." Joyce noted that he was in South Florida to help out on the design of a new letter campaign. "It's a collaborative effort," he explained, acknowledging that Tilton doesn't actually write the highly personalized letters himself. Does Tilton pray over viewer prayer requests as he says on TV? "Absolutely," Joyce contends. "Everything he says he does, he does." Ole Anthony, whose Dallas-based Trinity Foundation assisted PrimeTime Live with its 1991 expose, says he's not dismayed by Tilton's return to television. "I don't think there's any way he can make it back into the big time," Anthony says. "He needs to go back on the air periodically to rejuvenate his mailing list, but I think he'll continue to be a minor player...There are too many questions out there about his practices." Anthony, a former government spy, millionaire businessman, and candidate for the Texas Legislature, underwent a religious awakening in 1972. After a stint as a religious talk-show host, he founded a small community of believers in East Dallas who attempt to live like early Christian apostles. The group also monitors and investigates televangelists, sometimes with a vengeance. Virtually everything that is known about Robert Tilton's business operation and off-air lifestyle has come from documents and recordings gathered by Trinity Foundation members during their periodic undercover forays and trash sorties. Are Trinity operatives gearing up for a duel in the sun, a special project in South Florida? "There's no question we will continue to monitor Mr. Tilton's activities," Anthony says, "as long as he continues to invite himself into people's living rooms and mailboxes." The two other preachers who shared ABC's PrimeTime Live spotlight with Tilton six years ago have long since exited the airwaves, though W.V. Grant is back in the pulpit in Dallas after serving time for tax fraud. As for Tilton, he was observed at the Miami Beach Marina one recent Friday night. At first, the self-described "apple of God's eye" sat alone with his thoughts and a plate of stone crabs. Then a well-wisher sidled up and engaged him in conversation. Finally Tilton paid his tab and departed, generously donating the remains of his stone crabs to his new admirer. Outside he bore west across the MacArthur Causeway, then ducked into the Fisher Island Ferry terminal to avoid pursuit by a reporter. According to a representative of Fort Lauderdale yacht broker Chic Marine, his boat was repossessed by the finance company earlier this year. "He loved that boat," says a secretary, who wouldn't give her name. "But he let the bank take it back so the wife couldn't get it in the divorce." "Your source is a damn liar," Joyce retorts. "Bob just couldn't pay the bills. He spent everything he had on that woman in 18 months and now he simply has no money left." Joyce says Tilton's recent trip to Israel and Europe was an opportunity to line up locations for future live broadcasts. He promises his client will be back in Dallas to preach in November and December. Surprisingly, Joyce says even he doesn't know where Tilton hangs his hat. "I don't have the foggiest idea," he says. "But if I did, I wouldn't tell you. We were audited by the IRS. We were investigated by the FBI. We had 12 lawsuits filed against us. You tell me: How could anyone stand up under this? The depositions, the interviews, the allegations. This an honest minister that has all but been destroyed by the media. But he survived. He feels very comfortable wherever he's at down there in Florida. http://www.dallasobserver.com/issues/1997-11-06/feature2.html/page1.html (this is an old link but can be varified by emailing the Dallas Observer at www.dallasobserver.com ). Send us your thoughts on this article. We used the article above from the Dallas Observer because it covers Robert Tilton as well as anyone could. I am sure there will more news of interest coming about Mr. Tilton in the future. Blessings, Robert Wise.